The development proposals seek to provide accommodation for both the current Upper School and Lower School at the Lower School site to facilitate the redevelopment of the Upper School site for residential dwellings. The Academy development includes integrating the ARK Theatre and Sports Centre on the Lower site. These proposals have been developed for Hertswood Academy by Bond Bryan Architects, in conjunction with the Contractor Willmott Dixon Construction, Mott Macdonald Engineering Consultants and Bond Bryan Landscape Architects. 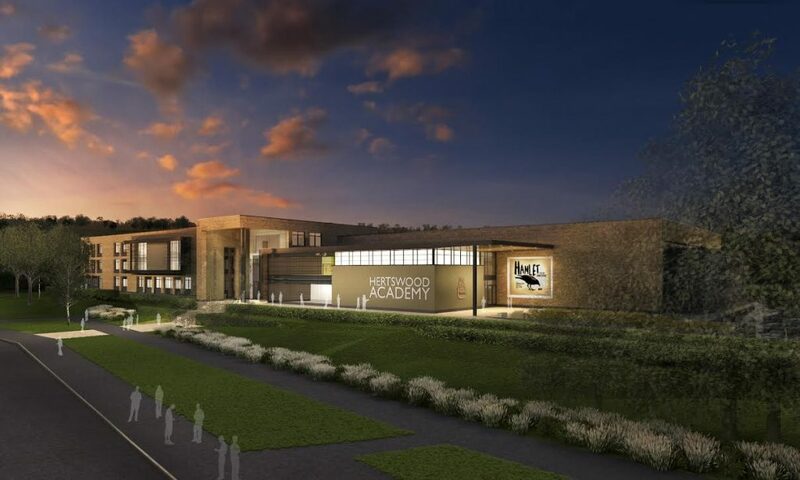 The detailed design to construction will be developed with the Academy’s sponsors the Meller Education Trust and the staff and governors of Hertswood Academy and their advisors. 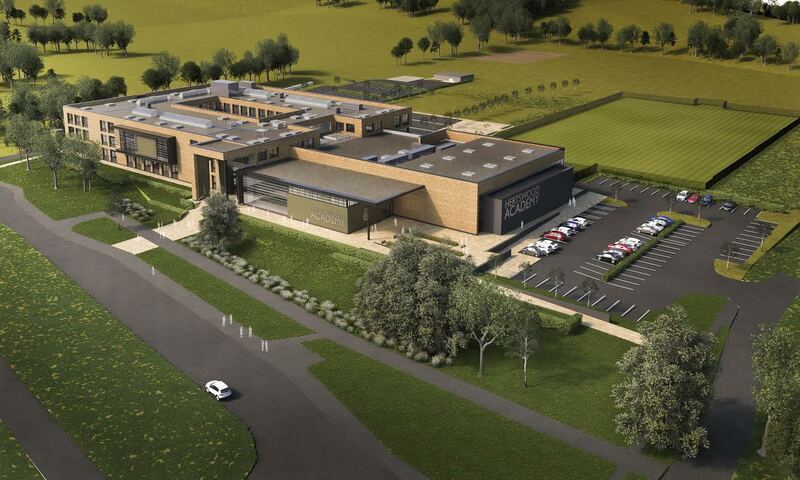 The current Lower and Upper schools will both be co-located in a single new Academy building on the Cowley Hill site. The masterplan will include the provision of parking, drop-off, play and sports provision across the site. “Our designs for this site deliver a bespoke solution that has been developed in full consultation with the Academy and its governors, Local Authority and other stakeholders and built upon the foundations of an established landscape setting. It will provide an integrated campus within a single building that creates a strong sense of place. Flexibility in all teaching and learning spaces will be maximised to enable the Academy to respond to changing demands and forms of curriculum delivery. The way in which this will be achieved is by standardisation of the specification of services to allow the majority of rooms to accommodate most subject areas. This will involve the use of technology by the extensive provision of network access, interactive whiteboards and projectors. The ARK Theatre is a vital component of this project. The Theatre has been integrated into the Academy building, but will offer public access via a separate community entrance. A box office, cloakroom, refreshments bar, kiosk, an audio and lighting control room, stage and scene dock to the rear will form part of the theatre, which is designed to accommodate 250 seats. The Sports Centre has been designed such that it can be completely segregated from the Academy and will be open for community use outside of school hours. It comprises of a four badminton court sized Sports Hall to current Sport England standards, a double height activity and dance studio, a fitness gym and associated changing and toilets. Hertswood Academy, which replaces the former Hertswood School, is a coeducational secondary school situated in the North East of Borehamwood. Hertfordshire. The Academy will provide a world-class education for 1200 students aged eleven to sixteen and 200 post sixteen students. It was launched in January 2013 as an Academy in the existing buildings on the Lower and Upper sites and in late 2018 will move into new buildings on the Lower Site subject to this planning application. 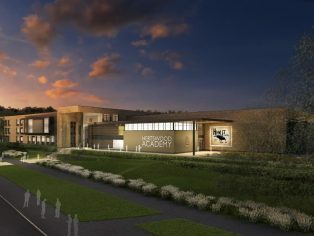 The new Hertswood Academy will be an 8 Form Entry Secondary School accommodating 1,400 Pupils (including 200 Sixth Form Pupils). The Academy building will provide 12,005 sqm of new accommodation. Construction on site is planned to commence Summer 2016 with a completion date in 2018.